Scalability of object detectors with respect to the number of classes is a very important issue for applications where many object classes need to be detected. While combining single-class detectors yields a linear complexity for testing, multi-class detectors that localize all objects at once come often at the cost of a reduced detection accuracy. In this work, we present a scalable multi-class detection algorithm which scales sublinearly with the number of classes without compromising accuracy. To this end, a shared discriminative codebook of feature appearances is jointly trained for all classes and detection is also performed for all classes jointly. Based on the learned sharing distributions of features among classes, we build a taxonomy of object classes. The taxonomy is then exploited to further reduce the cost of multi-class object detection. Our method has linear training and sublinear detection complexity in the number of classes. 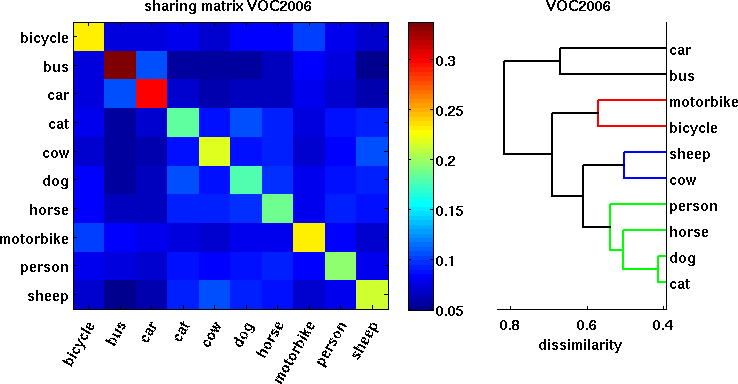 We have evaluated our method on the challenging PASCAL VOC’06 and PASCAL VOC’07 datasets and show that scaling the system does not lead to a loss in accuracy. 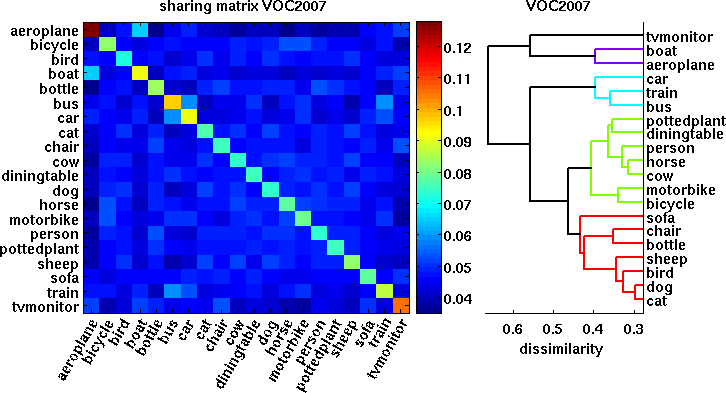 The sharing matrices of appearance and the automatically built taxonomy for the PASCAL VOC'06 and PASCAL VOC’07 datasets. If you have questions concerning the source code, please contact Nima Razavi.